This is a picture of our family car sitting in our garage in Italy. It has been sitting like this, alone and un-driven, for eleven months. It’s the reason I didn’t blog much last year, because every post was an avoidance of the car, and writing or even thinking about the car had me fighting off depression. I can be a bit melodramatic, but I’m not being melodramatic now. I couldn’t think about our car without rage one moment and a sadness like shame the next. This country took a piece of me last year. After what happened with our car, I ceased to believe in fairness and stopped trusting in the rule of law, because in many ways neither exist in Italy. Here, then, is the greatest mistake we made in our move abroad: we imported our car to Italy from California. If you’ve ever lived in Italy, you’ve already gasped in horror or bust up laughing at the audacity and foolishness of this statement. We were forewarned, of course. Every blog post and website and internet forum warned us off, told us to sell our car and buy something similar here. Please understand, it’s not like we were reading horror story after horror story about car imports. Most expats stated that it was too much hassle and bureaucracy to import a car, so they hadn’t ever tried. We didn’t find this kind of nay-saying very convincing, and in any case we thought (again, foolishly) that our car constituted a rare case. 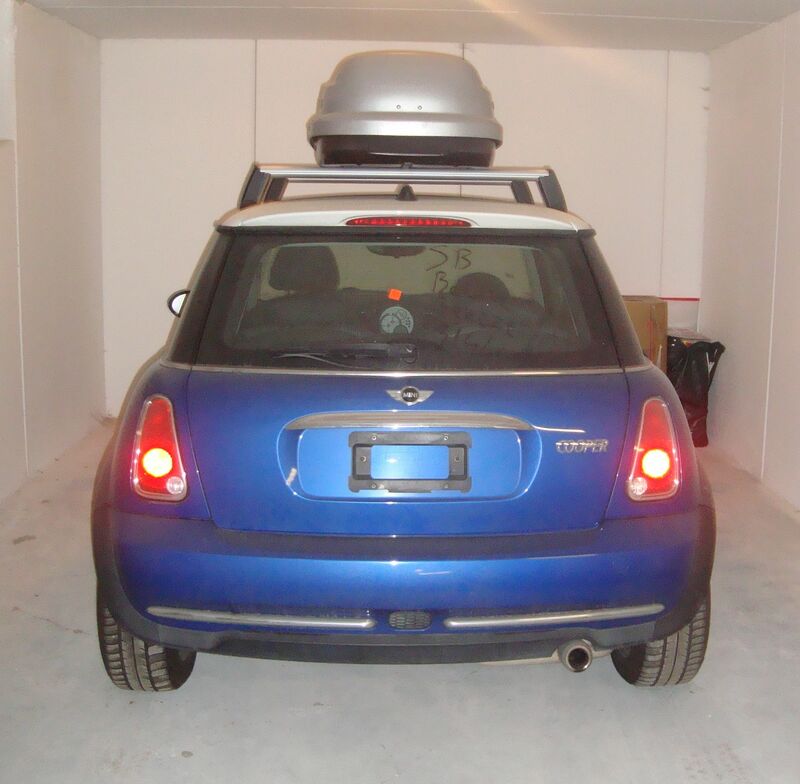 We looked at the costs and determined that we’d never get enough money from selling our car to buy a reliable, used family car in Italy because after being rear-ended at a stoplight, our sturdy 2005 MINI Cooper had halved in value. Moving to Italy as a grad student and a self-employed writer, there was no way we could afford any car but the one we already had. It was as simple as that. There were some other hurdles to consider, of course. EU compliance? Maybe some minor toggle changes, but MINI is an EU-made car and research showed no mechanical differences between those sold in Italy and the USA. Legality? We found a reputable importer to process the paperwork for a small fee. Value Added Tax? Not applicable since we’d owned the car outright for three years. The only unknown in our research was registration. I found one or two blogs that told tales of bringing a car over but having difficulty figuring out how to register it in Italy. Still, we read every web article we could find, and all assured us it was possible. The American Embassy website detailed the necessary documents, and the Italian motorizzazione (aka Department of Motor Vehicles) website listed the full process for registering a non-EU vehicle and getting Italian plates. Ta da! We scheduled a shipment, had our paperwork in order and sat back to wait for our car to arrive. WARNING I’m not going to try to make my long story short. Now that I’ve started, it feels a bit cathartic, so I’m in it for the whole story. If you’re already feeling sick to your stomach, you may want to take a week’s vacation from this blog. This will take several posts. The license plates were gone, stolen in transit. It’s pretty clear what happened. The ship spent a night in a Belgian port on its way to Italy, and we had personalized plates: REISEN, the German verb “to travel.” Someone working the docks thought that was pretty cool and took the plates home to hang on his or her wall or to sell on the black market (apparently there’s a black market for this). We couldn’t drive the car without plates. Everyone agreed we’d be pulled over within minutes. And for some reason the port authority and our import company were disinclined to have us file a police report that morning. I imagine we were becoming a burden. The importer called in a favor (ahem) and was able to get the MINI on a truck that would deliver it to our front door in less than a week for only 210 euro. This is a steal. I don’t want to know what the original favor was. Funny enough, the trucking company later told us they couldn’t possibly deliver for another month due to there not being any other deliveries to our province. We complained to the importer, and the car showed up the next day. Hmmm. You can drive on foreign plates in Italy but only temporarily. With a naked car, however, we were doubly motivated to obtain shiny new Italian license plates. When the car arrived in Trento, we hurried to our local motorizzazione office to get it registered. Armed with the necessary papers (title, customs declaration, import forms, proof of insurance) and a print out from their own website outlining the process for registering a foreign car, we entered the Trento DMV. We’d been in Italy only four months and spoke very little Italian, but we had a darn cute one-year-old with a gift for making Italians swoon. We were also sopping wet from a long walk through a fierce rainstorm. Within minutes, we were escorted to a small, second-floor office where a man behind a computer told us that registering a non-EU vehicle could not be done. I handed him the printout that listed the process and paperwork. I showed him our papers. He shook his head. It cannot be done. Um…. I honestly didn’t know how to say “our plates were stolen” in Italian, and we hadn’t yet filed the police report, so the denuncia wasn’t among the papers we had brought. At this point, we thought we’d be getting Italian plates soon, so the missing CA plates would be a problem of the past. I instead replied that the law says I must register my car in Italy. This is true. Italian import law states very clearly that Italian plates and registration must be obtained within six months of import. What better proof of feasibility is that?! If the law says I am required to register my non-EU car, then there must be a way to register my non-EU car, but the man in charge of car registrations merely shook is head. Again. It began to infuriate me that logic was not working in this situation and that my lack of Italian prevented me from all but simple, declarative sentences while the DMV official rattled off explanations that I could only one-tenth understand. Two other motorizzazione employees were in the tiny room as well, alternately watching my exchange with the man at the computer and J’s attempts to keep G content. We were at an impasse. Mr. Motorizzazione was not going to process our paperwork, but I wasn’t leaving without a plan. At last he agreed to look up our car make and model and see if maybe it did meet EU standards. He would research what might be done to register the car and gave me a number to call in a week. Great, I thought. He’s never done a foreign registration before, but he’ll soon learn what needs to be done on his part and then he’ll be able to do his job. His colleague gave G a coloring page. We left. I was cold and wet and we had a long walk back. As we crossed the river into downtown Trento, a semi-truck hit a puddle and fully drenched one half of me with storm runoff. Yeah, it was totally one of those days. On the other hand, we’d met the person in charge of car registrations, we’d understood each other despite the language barrier, and I was 100% certain we were on our way to having Italian license plates. Maybe by our next big rainstorm, even, I could drive my baby through Trento rather than struggling with the stroller and a plastic rain cover that only wanted to blow away in the wind. However, when we told a handful of Italians about the encounter above, my optimism, which was unblemished by our exchange with the motorizzazione employee, began to crack. Our friends and neighbors all shook their heads. They assured us that the bureaucrat was just saying whatever we needed to hear to get us out of his office. He has no intention of registering your car, they said. He probably won’t even look into it. Wait, so when an Italian bureaucrat smiles, shakes your hand and says, “I’ll see what I can do,” what he means is “Bugger off, go away?” Um, yes, pretty much. I'm a writer and college instructor traveling the world with my husband and two young daughters. After eight moves in eleven years, in 2014 we decided to plant new roots in Fort Collins, Colorado. Time to buy bicycles and teach the girls how to ride! This entry was posted in Uncategorized and tagged Culture Shock, Expat Life, Importing a car to Italy, Motorizzazione. Bookmark the permalink. How entirely frustrating for you! Too bad that it engulfed you for an entire year . . . I wondered where you had gone. Well, I’m glad that you can write about it now…and even with a sense of humor. Sorry, Friend, for such an inconvenience! Thank you, D and C, for the kind well-wishes. We’re really happy to be putting this chapter behind us. I know too well your frustration. Among the various problems, it took me a year to get my car’s license plate conversion process to finish. From the arrival at port, it took about eighteen months. I too, have a car with California plates and I was one of the few people who completely the entire process by myself, without help of any Italian so-called “professionals”, who are in reality worthless. I tell you, it can be done, but it should never be done again. That’s why so many people discourage potential expats from importing an non-EU car. It is such a nightmarish process that makes your local DMV looks good. Most of the Italians who work at the motorizzazione never dealt with importing a non-EU car before and are not familiar with the process, they are neither familiar with the vehicle code about driving on your foreign plate. Technically, you can drive for six months as a tourist, one year as a resident on a foreign plate, but that can be extended by doing a re-importation, which is a process that depends on wit as well as choice of location. Anyway, if you want to complete the process, email me and I’ll can give you ideas that will actually produce result because I have done it. Ah, re-importation. That sounds interesting (and oh so Italian)! Thank you for the assist, but we just put the car on a ship back to the U.S. It will have a lovely new home with my brother-in-law, and we’re well rid of the liability. But I’m glad you posted, as it may help future reckless expats like ourselves. Well, I regret not knowing your problem earlier. My experience, while bad, is nothing as bad as yours in Trento. At least I could begin the process in the beginning once I gathered some necessary documents, which took months. The person in charge at the Trento motor vehicle office is incompetent and does not want to admit it, and he has no idea what to do, that’s why he denies your request. The re-importation is optional and only if you want to drive with your U. S. plates. Otherwise it is not necessary. It is also legal. Understanding the intricacies of the custom bulletins and rules makes this easier. There were times which I felt hopeless, angry and very disappointed and these were repeated felt during the many bureaucratic hurdles. However, in the end, I accomplished it and am helping another to do his. I too, had wanted to ship it back and give it to a friend of mine, but the only problem was that no shipper was willing to do the job, or respond to my call and email. I had no choice but to continue. You did the right thing, cut the loss and move on. Link – My wife and I are planning to (temporarily) move to Italy for 12-14 months next year. Until reading this, we thought it would be easier to ship our old, reliable car there. But, now I’m not so sure. I have Italian citizenship (dual with US). So, maybe I just shorten my trip by 2 months and forget about the registration or re-importation. Let me know if you have any suggestions. Some things to keep in mind as you make your decision: It will cost about $3,000 to ship your car each way. Consider timing — shipping will take 3 to 4 months. Leave ONE license plate on the car and bring the other with you. For such a short stay, I wonder if renting a car when you truly need one or joining a local car sharing program is a less expensive/less hassle option? I’d never recommend a permanent non-EU import, but for a year it may ultimately be the easiest for you, since you’ll never have to speak to a Motorizzazione employee. Good luck and enjoy your year! The simple answer is Don’t do it. You can find an older car here in good condition for 2000 to 5000 euros. If you haven’t brought it already, don’t even begin to think about it. Every American who did it regret their decision. If money and time is no object, then I still say, it’s better to donate your money to a charitable cause because even after the shipping and insurance cost, you will be facing document and process fees can add up to 1000+ euros for the registration process. Do you really want to donate money to various bureaucracies to support this bloated system? Heck, for less than the price ofr shipping your car both ways, I’ll sell you my car. It’s Italian plate and can be sold easily by transfering the title when I leave. Can you tell us about re-importation? We are moving to Marche in early 2014, and would like to know our options. The vehicle we’d like to bring over would be more of a farm truck and a vehicle to take to the beach rather than a driving car. Thanks! Re-importation was very simple for us, but we had California plates and current California registration at the time. For the return shipment, we used the same company that had brought the car over and much of the paperwork was the same. The trickiest moment was when we arrived at the dock to drop off our car and the dock workers weren’t expecting us and hadn’t completed their end of the paperwork. It took about 2 hours of international calls (us to the UK office, the UK office to the Port of Livorno and local exporters) for someone to finally show up and handle the exchange. Grr. In the end, the re-importation shouldn’t be a big deal because you can probably trust your local American DMV to follow their own laws. That said, if all you want is a work truck and beach trips truck, you’re best off just buying something local once you’re settled in and renting in the meantime. Less hassle, less risk, less $. Yes, I too am another in the midst of frustration. I imported my VW Passat 6 months ago from Indiana. Customs in Civitavecchia gave me the temporary importation document that allowed me to drive for 6 months with my Indiana plates. Of course, during these 6 months I learned that it’s nearly impossible to get Italian plates because my car doesn’t comply with the CEE. I just tried to extend my temporary importation permission but was denied. Your email mentioned that it’s possible to drive for one year on a foreign plate as a resident. Could you please provide more info? I would appreciate any help! I am a resident here but do NOT want to immatriculare my car because I am moving back to the States within 8 months. Thank you so much! And congratulations on having succeeded with your car!!! Amazing. I don’t recall whether I got the one-year rule from the person I spoke with at motorizzazione or if it was in the Italian driving code. I believe you have a year to get an Italian driver’s license (a process that usually takes many months, so best get on that), so I may have confused the two time frames. Link – please email me. I have a very old car with lots of sentimental value, and would like to have it there indefinitely. Thanks! I hear what your are saying and will seriously reconsider. We do not plan to ship it back to the US. (It is currently a 3rd vehicle for us now in the States). We plan to give it (donate) to missionary friends already in Italy. So, our expenses are really only one-way. We have a family of 5. So, finding inexpensive options in that size are limited, it seems. But, I really have not researched this angle much. But, purchasing a EU-based car certainly should avoid all the registration issues the Mr Motorizzazione put you through. But, thanks again for your input. One way or the other, your post and comments will save me lots of money, aggravation and/or time. i hope i read this post earlier because i use to live in Italy as an expat. i traveled all throughout the world with my motorcycle where i bought it in S. Korea (american made item). i had a Korean license plate on my bike for as long as i’ve been living in EU. no one in italy has pulled me over because of my plates that was from a different continent. now you should of also thought of getting custom made plates through certain web sites (i.e. : http://www.autoplates.com/custom-license-plates.php). italians are lovely people, but i find them to be very lazy when you try to get them to do their job. of course italians are also very corrupt in ways where you have to bribe them by either money or something of value to them. i found american Marlboro to be useful in bribing to people do their jobs. So how do military import their cars?? The Italians MUST know how to do but are probably too lazy. I am still importing my van, I’m hoping my husband who is fluent in Italian will put up with the garbage! Military importations are handled very differently than civilian car imports. They function under different laws. Basically, a car being brought to Italy for a military family is simply an American vehicle with American registration because the military base is considered American soil. At least, that’s my understanding from the few military families I’ve encountered–they basically didn’t have to deal with motorizzazione at all. If leaving military employment and remaining in Italy, however, the car does have to be officially imported and the nightmare begins. Why wouldn’t you just get replacement California plates? Good question. Eventually we did, but it took about 10 months and it involved filing a police report in Italy, translating it into English and mailing all that to the California DMV (if both plates are lost, the DMV requires a stolen plates report). Just talking the local police into writing out our report took time because the theft happened in Germany and wasn’t a local concern. Anyway, since you’re only allowed 6 months (some told us a year, but what I read from the US Embassy at the time was 6 months) to drive on foreign plates before you’re required to re-register the car as Italian, having those new CA plates weren’t going to do us much good if we got pulled over. We drove once on the replacement CA plates–to the port of Livorno to ship the MINI back to the U.S.
Do you still have this Mini in Italy? If so, America military can buy it and they are able to register it in the base they are stationed to. Check out bookoo.com and select the area in Italy you are cloest too. The Italian police, in some cities such as Mantova in particular, are a bit corrupt. They look for foreign plates, even from other EU countries, and pull you over. First they try to claim that your insurance papers are not correct. If they can get over on this one you lose the car, even if you later prove that the insurance was fine. They they look at the car itself. Even a large dent is sufficient for them to claim it is too damaged to be driven. Then they go over your drivers licence. Any non-Italian one is automatically deemed fraudulent or invalid. Again, you can lose your car. If everything is perfect expect a fine of around 500 euros. If not, there is no limit to the fine or loss of the vehicle. This sort of crap does not generally happen in any other EU country, and most larger cities in Italy are a bit more reasonable. Most likely your plates were taken at time of export from the US by US Customs. Plates are taken and returned to the DMV since they are DMV property. I know CA law requires return of plates if the vehicle is exported. An interesting theory, Tom! However, if it is standard practice for U.S. customs to confiscate plates, then the export company, the ports involved, and the DMV would all surely have recognized the lack of plates as perfectly normal, rather than royally freaking out. The port of Livorno was horrified because the lack of plates technically made the car an illegal import. This wasn’t their first American car import–but it was the first American car to arrive sans license plates. In the end, I worked closely with the California DMV to have new plates issued for the MINI from Italy. Sharon – it sounds like your italian experience is almost as bad as mine! What a nightmare of a country – if we had know how corrupt, complicated, time, money and ultimatley life wasting that place is we would not have even gone there for a coffee. Can I ask why didn’t you just sell your car while it was in Italy? Is it because it needs to be registered in Italy anyways before selling? Yes, that’s it exactly. The car couldn’t be sold within Italy because it wasn’t legally registered. And an under the table sale would leave the new owner in the same tight spot–convincing a motorizzazione employee to register the car and issue plates. Even a sale to a U.S. military employee would have hit similar hurdles. Thanks. After reading your post, I have already contacted our US shipping agent about intercepting the car in Germany and sending back to the states. Good luck. I’d like to hear how it goes. Will follow along on your blog! Well, the German agent did not really speak English and just hung up on me. So we will give it an attempt I guess. Might as well get some use out of it. The representative at USAA assured me that regulations changed within the last 6 months and I should be able to get it completed in a week or two. He said he’d been doing it for 2 years and never heard of anyone not being able to register their car or it taking months to do so. I told him the whole internet says otherwise, but ok.
Any news on how the import is going? It should be in Italy by now, right? Yes, we have the car now. We didn’t take have any issues getting it from customs they did not like that our insurance was printed online from an email and not the actual card, but that read about it. We’re in a similar boat. Just moved here from U.A.E. and shipped over our Audi tt – it’s currently still sitting on the docks for another day or 2 and we’re getting the same stonewall re registering. We’ve been told we can’t because it’s a euro 4 car.? Yuck! We were also told our MINI was non-compliant (it was built in the UK, go figure). But there’s supposed to be a test that a mechanic can perform that shows the car IS compliant, or they will give you a list of things to fix to make it eligible for registration. We never got that far, though. Motorizzazione stonewalled us completely and wouldn’t even allow the mechanical check. Still, ask if you can prove that it meets standards. Does anyone know how to have a vehicle completely deleted from the Italian registry? I gave away an old Saab in 2012 – now years later (and living in another country) the Italian are requesting car tax for the years 2013 and 2014 with fines. It seems like one has to pay it forever. If the new owner was to ignore the tax bills – as they do not live in italy – would it just fall back onto me again? seems impossible to deregister a car unless one sells or scraps it. Any suggestions? When I was there, the Expats in Italy forum was an invaluable resource for this kind of question. Unfortunately that group is defunct now, but their archives can be viewed here: http://www.expatsinitaly.com/articles-old-expatsinitaly.html You might find the answer you’re looking for. The web site has been relaunched and the group is now hosted on Google Plus Groups. However, for car import related questions, I setup a separate web site http://www.ItalyCarImport.com to help people. It is bested view on a computer because the mobile phone does not show drop-down menus containing many important sub-chapters. to take the car off the Italian rolls one must turn in the tags, and all paper work, Libretto , and folio commentary. If you send me your make and tag number I will try to locate the car for you. If you know who has the car you should call them. Thanks, Dan, for your offer. The car was never officially on the Italian rolls because we never completed the import. All the paperwork for removing the car was completed when we did, eventually, return the car to the U.S. (with California tags…the CA DMV was willing to issue us new plates internationally while the Italian DMV stonewalled us to the end). You guys all complicated matters. First of all you don’t ship the car to Italy to import it! You ship it and declare it as a tourist travelling around Europe. The plates travel with you in your suitcase or hidden in the car…not on the car! After 6 months you ship/drive over to Albania and leave it there for 6 months. From that point on, you are good to go keeping your non EU plates on the car. Have been doing this for some 10 years! Oh, I see. Yes, we complicated matters by trying to follow Italian law. It sounds much less complicated to leave the car in Albania for 6 months. Hey wow sorry to hear this… I’ve been searching a little for the best possible solution to this issue. I’m married to an Italian and we’re currently living in US. We desperately want to send our jeep to Italy when we move back over there but I know the Italian government pretty well…. and it’s very much so an anarchy over there. What import taxes did you have to pay since it was used? If you had your plates not stolen, would you have been alright? What did you end up having to do? Hi Jordan, I certainly understand wanting to bring your car with you. I don’t recall the exact import taxes but we mapped everything out thoroughly and the cost of shipping + import tax was less than what buying a similar used car in Italy would have cost. It would have been less complicated, indeed, if the plates had not been stolen (…and easily solved had we known to keep one plate with us. For those who like to lecture us on taking both plates in our suitcase instead, the port told us that we could not ship without plates as the registration would be invalid). That said, even with plates–which we did eventually acquire–the local motorizzazione was unwilling to complete an Italian registration for us, and we were essentially screwed either way. What we learned is that it comes down to the familiarity of your local officials with the process, and their personal willingness to complete the paperwork. As I’m sure you’re aware, that’s just how things work in Italy (anarchy indeed!). My advice is to contact the motorizzazione in the region where you wish to move and ask if they are familiar with doing a foreign import from the U.S. to Europe. That will give you the answer you’re looking for. As for us, we got new California plates issued and returned the car to the U.S., selling it to a family member. Thank you for writing this post. I am indeed in a similar situation. An American married to an Italian and trying to import the car from the UAE. It is so bad that I am currently trying to see the costs associated with shipping it back. We don’t even have regular plates on the car. the DMV equivalent in the UAE takes back your plates and registration upon exporting so a very bright blue set of plates sit on the car at the port saying export vehicle. That is actually the least of my problems. I cannot even transfer the vehicle to my husband who is an Italian citizen as the car was under my name in the UAE and he would have had to prove ownership which he can’t. a complete mess. I’m at a total loss. I hate these situations, but it looks like they happen everywhere. It seems when you get in touch with these relocation companies they just say everything is A-OK and then leave you stranded when you get there (they do take your money though!). For me health care has been the deal breaker moving from Spain to Slovakia… Believe me, I asked a million times before coming and was told I was covered, but I’ve been here for 4 months and still don’t have a GP (I am regularly paying Social Security – which I was unaware I would have to pay – and the moving company got their fee, but no doctor for me). The car is still a process, adding up to +1000€ more than expected (and I’m talking within EU!!!). Thankfully it doesn’t seem to be as much of an ordeal as your experience! What an informative thread. Thank you all. What a godsend to find it. I am considering importing an Audi Q7 from the US to Italy and am looking for the right Audi contact in Germany to see whether the car is compliant (COC) and if not what modifications might be necessary. My expectation is that the costs will be prohibitive, but I don’t speak german and wonder if anything can point to the right place to check on compliance. I wish I had an answer for you. I think you’re on the right track in checking with a German contact for this info before getting to Italy. Maybe someone who follows this thread will be able to point you in the right direction. Good luck! I went through this process by myself, successfully, albeit begrudgingly, to import a car from the U. S. to Italy. For those of you who are interested, I wrote a very detailed account and step by step guide on http://www.ItalyCarImport.com where you can learn what I paid for shipping, insurance, omologation process, title fee, registration, bollo and other expected and hidden fees and procedures. I think the best way to make this type of decision is to be fully informed of all the details. It’s been a few years since I reviewed the law, but it’s always been 6 months in the past. Of course, you would need to show when that six months began through some form of entry document. What part of Italy will you be in, primarily? If your license plate stands out as being foreign or unusual, I would plan on getting pulled over from time to time by a curious cop.